Sketch Theatre is a website that collects the timelapse videos of professional artists drawing. You can watch in detail their process and techniques while the music is playing in the background. You should also check out the Sketch Theatre Vimeo page. 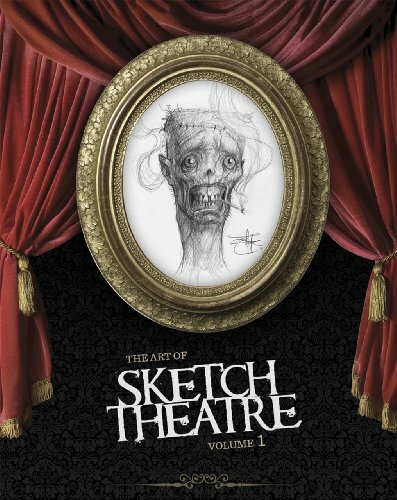 The Art of Sketch Theatre Volume 1 features 58 artists from the website. These are artists like Aaron Sims who's art director at Stan Winston Digital, Alex Alvarez the founder of Gnomon School of Visual Effects, Dave Dorman, Terryl Whitlatch, Wayne Barlowe and more. They are from different fields such as film design, commercial illustration, video game design, print publishing, animation, fashion design, etc. The artworks are wonderful. They are mainly paintings, with the some sketches, sculptures and even tattoo art. It's a mixture of commercial and personal works. They are printed big in this huge 240-page hardcover. There's a mixture of lowbrow, fantasy elements and more, but mainly towards the dark side. It's things like crows in hair, ghoulish creatures, guy with one nostril and a stitched up head puffing a cigarette (on the cover), people wearing animals masks. They are mostly pretty detailed pieces of art. It's a great artbook if you like this kind of art.